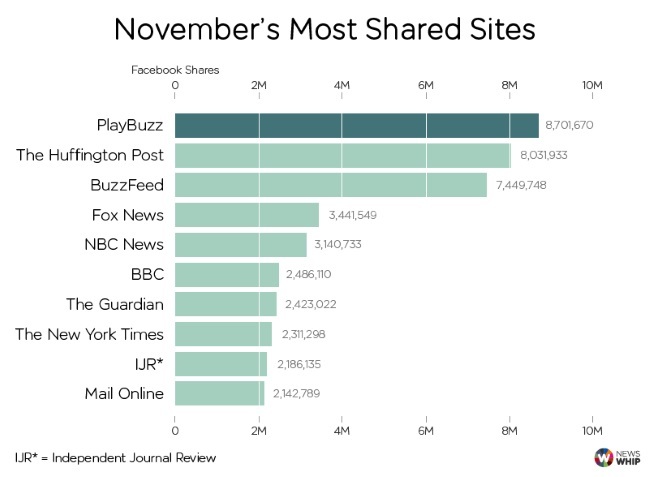 Quiz site PlayBuzz continued its surge in Facebook shares, vaulting to the top of NewsWhip’s ranking of publishers for November, and marking the first time since NewsWhip began compiling its rankings in August 2013 that neither The Huffington Post nor BuzzFeed occupied first place. Right-wing political site Independent Journal Review is back in the top 10 after a short absence. The Conservative Tribune, Tea Party News Network and Western Journalism also make appearances in the top rankings, confirming that politics was hotly debated on Facebook last month. Many of these sites had stories in the most-shared list, bringing up their monthly totals. Most of their interactions were also likes, which suggests that a large part of theses sites’ total interactions took place on Facebook itself. Last month, the reach of IJR was ahead of more mainstream news outlets, including The New York Times and The Guardian. Those sites were pushed down the rankings and saw their totals decrease slightly on October’s numbers. With Facebook looking as though it may be directing more attention to breaking and “hard” news in the near future with the reported expansion of its Trending feature, news publishers will be battling even more for attention and space. In times of major breaking news, traditional outlets are likely to find themselves jostling for space on News Feed alongside digital newcomers, with high traffic and engagement potentially at stake. Yahoo and ESPN dropped off NewsWhip’s top 25, while IFLScience returned to the list, joining newcomers MoviePilot and Rare.us. Readers: Have you ever engaged with PlayBuzz on Facebook?